The life of civil rights leader Martin Luther King, Jr. is closely linked to the National Association of REALTORS®. In the summer of 1966, he moved to Chicago and engaged in a series of marches, appealing to real estate practitioners in the city to end discriminatory housing practices. King's call for open housing led to the 1968 passage of the Fair Housing Act. 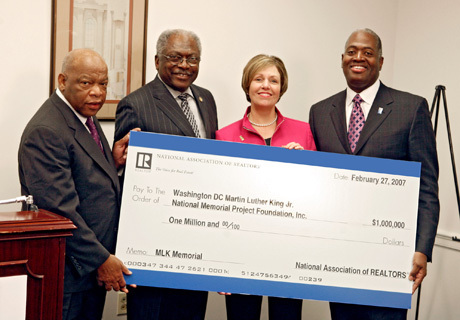 In February 2007, underscoring its mission to make home ownership viable for all Americans, NAR made a $1 million contribution to the Washington, D.C. Martin Luther King, Jr. National Memorial Project Foundation. To this day, the Association continues to honor the legacy of Martin Luther King, Jr. NAR's Diversity & Fair Housing Program enables REALTORS® to help buyers of any cultural background achieve the American dream of homeownership. The association led industry efforts in 1988 to get important amendments made to enhance fair housing laws in the Fair Housing Act.